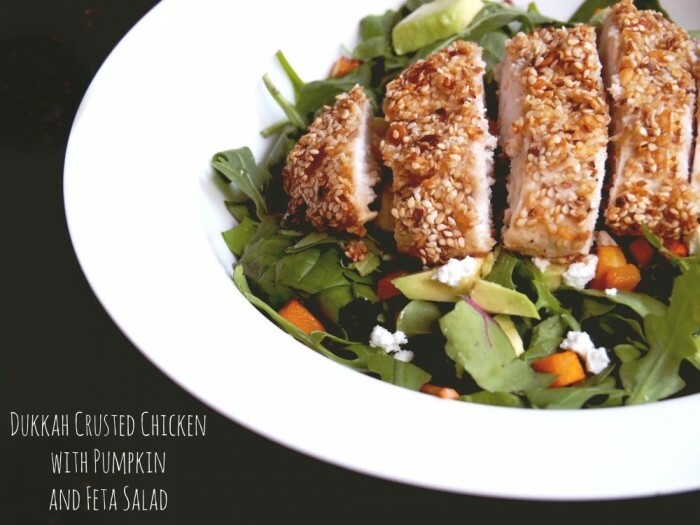 This is one of the first recipes I posted and my how things have changed! Not only has my health improved, but I’d like to think my photos and my eating have too. When I first posted this recipe it was served with shop bought oven chips, something I haven’t eaten for years, and carbs for dinner is something that we haven’t eaten for weeks. Anyhoo, you can make your own dukkah and tailor it to your taste, but I had a jar in the pantry that was looking a bit redundant, and I’m all for a kitchen shortcut. This is kind of a pimped up chicken schnitzel but the salad (which was everything I had left in the fridge) really lightens it up. 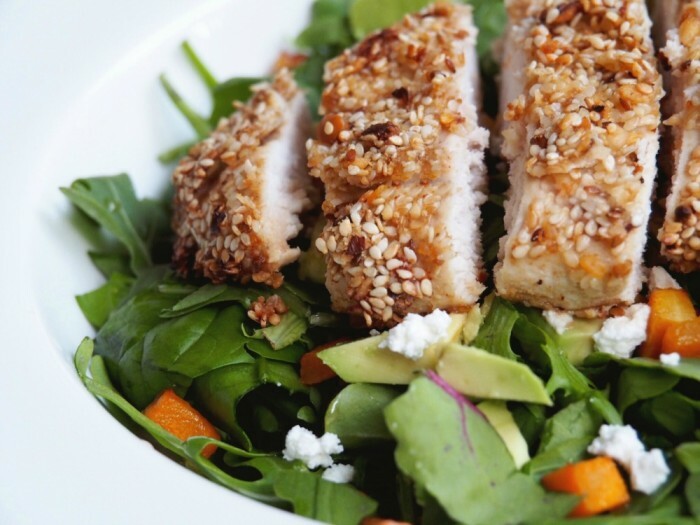 I think Dukkah Crusted Chicken V.2 is a huge and most delicious improvement. I hope you think so too! Preheat oven to 200 C/ 180C fan-forced. Line 2 baking trays with baking paper. Dip chicken in egg, then in the dukkah to coat. Place chicken on one of the baking trays. Toss pumpkin in olive oil and place on other baking tray. Bake pumpkin and chicken for 10 minutes and then turn the chicken over and shake the pumpkin to ensure an even bake. Cook for another 10 minutes. Meanwhile, arrange salad greens on plates. Allow chicken to cool slightly and then slice thickly. Top salad with pumpkin, avocado and feta.